Hopefully it will prove to be ‘the’ blizzard. We just had the first blizzard in the new house. It was an experience! We stayed warm, eating freshly picked lettuce from my basement aquaponics system – can’t beat that, eh? Tuesday afternoon, I went home from work a couple of hours early. I cleared the 3 inches of snow that had fallen thus far from my drive and the neighbors drive – mostly to clean up the snow-plow heavy stuff at the ends of the drives. The power sagged a bit Tuesday night, and we came back up, but across the street was without power for a few hours. We lost power again for about half an hour, and when it came back up, both us and across the street had power. ComEd must have patched something together in the middle of the blizzard. Wednesday morning, I had a text to work from home from the boss. Sweet. So I watched the neighbors across the street dig themselves out. Late morning, I took a break from work and figured I would spend an hour with the snow blower. I made one trip from my garage to the street and then helped the neighbor across the road clear the last 3 feet of snow. That snow-plow packed snow is the worst when you only have a shovel. I had just about got him done when one of the belts on my snow blower broke. I went back inside and tweeted the broken belt and the neighbor responded on facebook that they may have one. Sure enough, they did! So I took my broken belt over and the neighbor was snow-blowing. So I grabbed a shovel and helped out. I did around the vehicles, and along the building and up the walk where the blower won’t go very well. After some more work, I went back outside and put the belt on. Just as I tightening the bolts up, the neighbor came over with his blower. The two of us made quick work blowing out my drive. Having good neighbors makes all the difference between an easy dig out and a miserable one. Dryer vents can be easily covered with snow, so make sure they are clear before you use the dryer. The snow blower is 6 inches too short – it’s a lot of work to muscle that heavy machine around all stooped over. 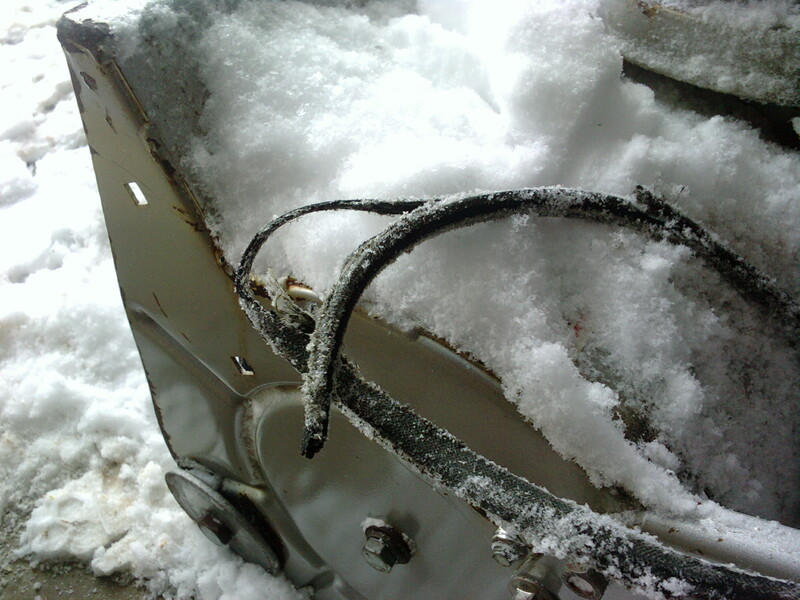 The snow blower needs spare drive & blower belts. It also needs a good going through with a wrench to tight all the bolts. Bobcat Alternator belts will work in a pinch, but they check pretty bad pretty quickly. Waterproof gloves, once wet, stay wet. The city likes burying the fire hydrants with their plows. If you ship live fish from CA, they WILL be shipped during a blizzard. Somebody will call the cops on you if you go out and look at all of your windows in the middle of a blizzard.